There will be no training in St Andrews on Saturday the 13th April to facilitate attendance at Irie Shihan's course hosted by the Irish Aikido Federation at their Macken Street dojo. Due to another event in St Andrews, there will be no training on Saturday the 30th March. We will join Charmant Sensei at the Morning Star Dojo for an introduction to karate training at 11.00. The death has occurred of Kanetsuka Minoru Shihan. Sensei contributed hugely to the development of Aikido in Ireland and to our development as a club and as individuals. We owe him a great debt of gratitude and will remember him. 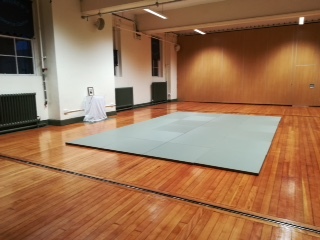 We will be joining our friends in the North London Aikido Club who are hosting a course in the superb Dartford Judo Club in London with Sugawara Shihan. Looking forward to seeing many old friends. The dojo in St. Andrews is not available on Saturday the 13th October due to Open House. Come visit the old school if you are free. We're ready to welcome you. But why Aikido? After 40 years training - at various levels of commitment depending on life circumstances - is it about playing with my grandchild and not having to rest up for a day afterwards? Is it about understanding and dealing with aggression? Is it about choosing whether to feed the animal instinct or honour the human one? Is it about strategic awareness, not just seeing the small picture or the big picture but seeing both? Questions I am still asking but it's fun. It's worth the blood (very little but some bruises), sweat (quite a lot) and tears (not many, mostly tears of exhilaration). Try a session or two or ten. If it's not for you, nothing ventured nothing gained. Current fee per session is €8. There is no training in St Andrews on Monday the 2nd April. Training resumes on Thursday the 5th. There is no training in the Pearse Street dojo on St Patrick's Day, 17th March and Monday the 19th March.